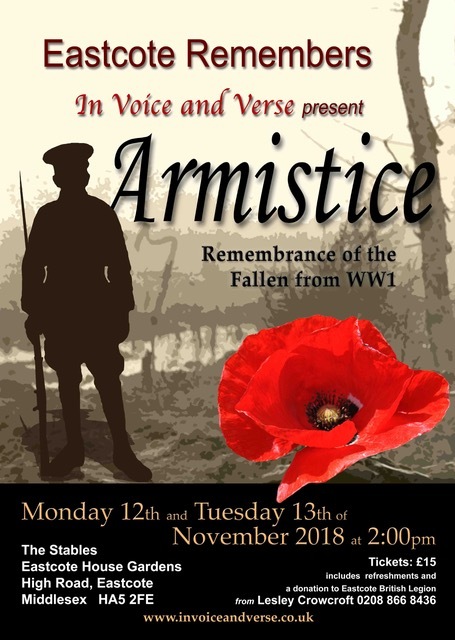 Eastcote Remembers – Armistice Events November 4th – 17th at the Stables, Eastcote House Gardens. A fortnight of talks, concerts and an exhibition, to commemorate the young men from Eastcote who served their country 1914-1918, some making the ultimate sacrifice. Also, to highlight life in Eastcote 1914 -1918. Venue the Stables, Eastcote House Gardens. Tuesday 6th November 2pm: Talk: Eastcote 1914 – 1918. Liz Smith, Edible History Society, Susan Toms RN&ELHS, Lesley Crowcroft FEHG. Free event. Thursday 8th November 7pm: Talk: ‘Is it Ticking?’ Bomb disposal from the Western front to Helmund Province. Matt Neave, former captain in the Corps of Royal Engineers. Free Event. Thursday 15th November 2pm: Talk: History of the Eastcote Branch of the Royal British Legion. Matt Neave. With WWI memorabilia on show. Free event. All monies raised will be donated to the Royal British Legion Eastcote Branch. Collecting boxes will be available at the end of the talks and during the times that the exhibition is open.